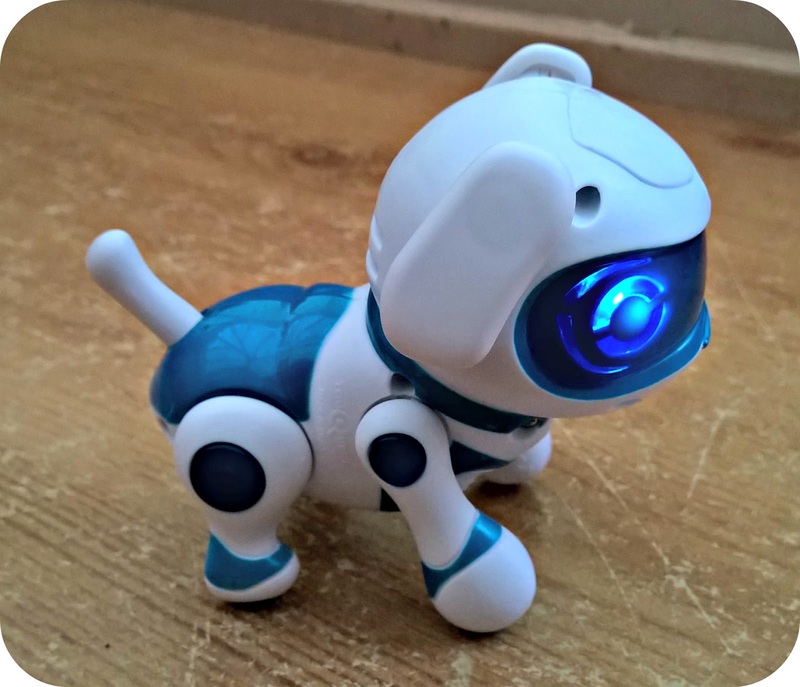 One of the must have toys for last year was the Teksta Puppy, Kitten and Dinosaur and I know it made lots of Christmas lists. Now the original Teksta Puppy and Kitten have a brand new newborn addition to the range and we've been taking a look at the Newborn Puppy. We don't have a huge amount of electronic toys here, it's just not a genre my children have been massively interested in so I was interested to see what they would make of it. 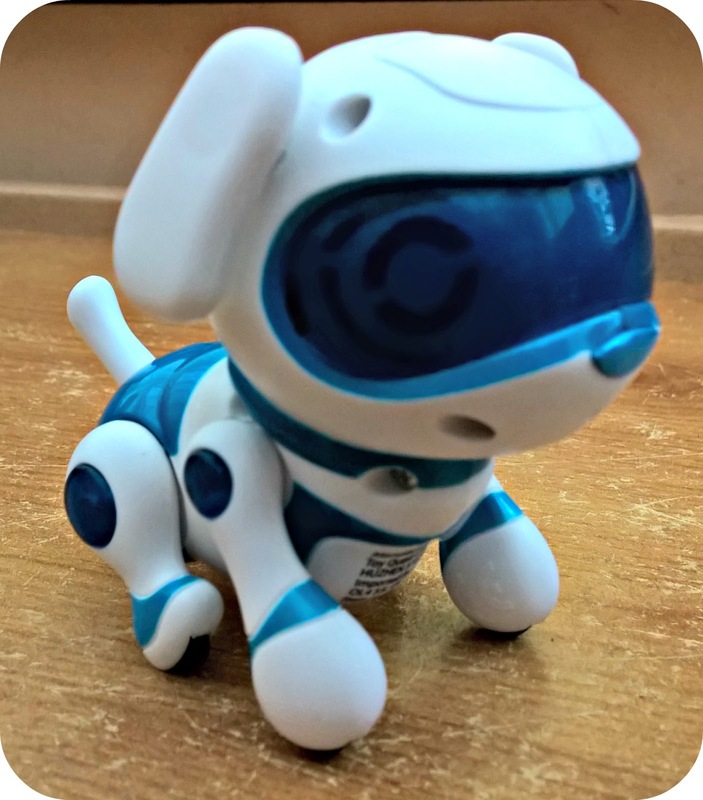 The Teksta Newborn Puppy is a small robotic dog, small enough to sit on the palm of my hand and very easy for LM and Bud to pick up and carry around. He is powered by 2 AAA batteries and you will need a small Philips screwdriver to fit them. You can then switch on the dog using the on/off switch on his underside. Puppy has three modes - walking, sitting on his back legs and singing. He responds to your voice or clapping and will bark, flash his eyes and move his ears in response. If you want him to walk you need to ensure that his front legs are in a forward position otherwise he tends to fall backwards. To make him sing you press and hold the button on top of his head until you hear a noise, then speak or clap and then he will sing. Teksta Puppy is aimed at children aged 3-8 and, despite LM being a little younger than 3 she loves him with a passion. He's quite sturdy and we've had no difficulty with him being toddler proof. Apparently the front legs can come off but it isn't a problem we have had. My parents have a five months old Bearded Collie puppy and we took Teksta to meet him, to see what a real life puppy made of his robotic counterpart. It turns out that tiny robotic puppies are quite scary for big, brave Bearded Collies! 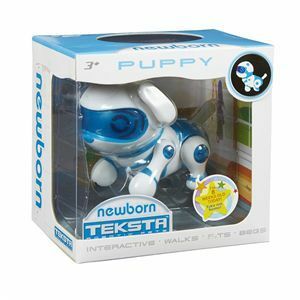 Teksta Newborn Puppy has an RRP of £19:99 and represents a great way to introduce younger children to robotic toys.